GALION — After opening their season with a victory last Saturday, the Galion Tigers hosted the Pleasant Spartans for a MOAC clash on their home diamond on Tuesday, March 26. In a shortened, five inning contest, the Tigers run-ruled their guests by a final tally of 10-0, holding the Spartans to just two hits while recording seven of their own. Pleasant committed two errors and stranded two runners in the game while Galion had one miscue and left four on base. The Tigers got out of the gate with five runs in the home-half of the first and never looked back. Cameron Payne earned the win on the mound, going a complete game while scattering the two hits and striking out six Pleasant hitters. At the dish, Payne ripped a single and proceeded to record a stolen base and two runs batted in. Other offensive numbers for the Tigers were: Utz- 1B, 3R, SB; Spencer Keller- 2-1B, R, RBI; Manring- 2R, SB; Symsick- 2R, 2SB; Karnes- 2B, R, 4RBI; Carter Keinath- R, 3SB and Jackson Staton- 1B. 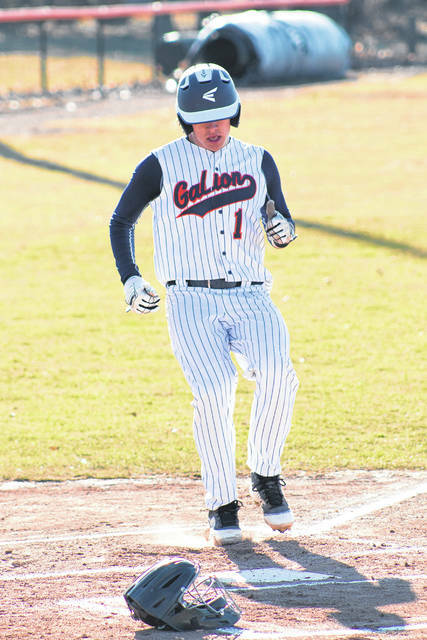 MARION — The Galion Tigers baseball team headed to Marion to clash with the Pleasant Spartans in their second game against one another on Wednesday. Pleasant would manage to avenge Tuesday’s defeat, handing Galion their first loss of the season by a final score of 8-0. The Tigers were held to just two hits on the afternoon, both singles, coming off of the bats of Ryan Utz and Brody Symsick. Galion would strand all four of their baserunners on the day and committed five errors in the field in the loss. Symsick suffered the loss on the mound, allowing just one hit but three runs while walking two and striking out a pair in one inning of work. Troy Manring tossed four innings for the visitors on Wednesday, allowing three hits while walking one and fanning a pair. Jacob Lear had a rough outing on the hill, lasting just ⅓ of an inning and giving up four runs (three earned), issuing four walks in the process. Clay Karnes worked the remaining ⅔ of an inning, surrendering a hit and an unearned run. Pleasant scored two runs in the bottom of the first and another in the bottom half of the second before unloading for five runs in their portion of the sixth inning. In total, the Spartans collected five hits, committed one error and stranded five runners on the base path. Next up for Galion will be a trip to Attica and a non-conference doubleheader with the hosting Seneca East Tigers on Saturday, March 30. The Tigers will hit the road again on Tuesday, April 2 for a Mid-Ohio Athletic Conference clash against the River Valley Vikings. GALION — The Northmor Golden Knights were finally able to get their 2019 season underway on Tuesday and did so by hosting Knox-Morrow Athletic Conference foes, the Fredericktown Freddies. Evans would play the hero for the home team, providing a walk-off single in the bottom of the seventh that plated both Bryce Downard and Reeder to give the Knights the 4-3 victory. Northmor scored their four runs on eight hits, committed no errors and stranded five on the base path while Fredericktown plated three runs on five hits, had zero errors and stranded eight. Mariotti earned the victory on the hill, pitching the final 2⅔ innings, giving up just two hits while surrendering a walk. Bood started the contest and worked 4⅓ frames, allowed three hits, three earned runs, walked three and fanned a batter. Other offense was provided by: Reeder- 1B, 2R, SB; Evans- 1B, R, 2RBI, SB; Mariotti- 1B, 2B, RBI; Pierce Lower- 1B, 2B; Bood- 1B; Tyler Brown- SB; Kalob Barney- R and Garrett Corwin- 1B. 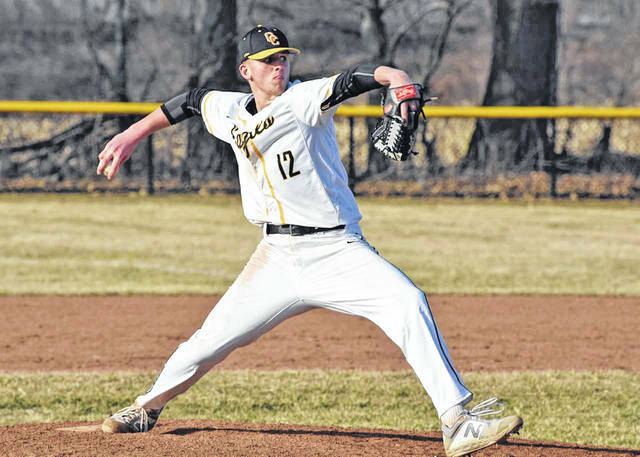 FREDERICKTOWN — After edging the Freddies on their home field, the Northmor Golden Knights baseball squad hit the road for the second game in the series on Wednesday. Unfortunately, the Knights wouldn’t be able to keep the momentum going and hosting Fredericktown would earn the three-run victory; 6-3. Northmor would get on the board first, scoring in the opening frame but the Freddies would bounce back with two in the bottom of the first. The Knights would proceed to tie the contest in the second before Fredericktown rallied for three runs in the home-half of the third to put the game out of reach as Northmor would only tack on one additional run in the top of the fifth. Both teams finished the game with seven hits while Northmor committed two errors in the field to Fredericktown’s one. The visitors stranded eight runners throughout the contest and the Freddies left seven aboard. Brayden Black took the loss for the Golden Knights, pitching 2⅔ innings on the day, giving up six hits, five runs (three earned) while walking one and fanning three. At the dish, Black belted a single and scored a run. Wyatt Reeder tossed 3⅓ innings for the visiting Northmor squad, surrendering just one hit, a run, walking three and striking out two. Reeder also managed a single and a run at the plate for the Knights. Hunter Mariotti finished the contest with a double, a single and a run batted in while Chris Bood turned in a two single performance. Mostyn Evans recorded a single and an RBI while Ryland Thomas scored Northmor’s remaining run. The Knights are set to head to Mansfield for a doubleheader with the Senior Tygers on Saturday, March 30. A pair of meetings with the Danville Blue Devils awaits Northmor on Monday, April 1 (home) and Tuesday, April 2 (away). NORTH ROBINSON — The Colonel Crawford Eagles began their Northern-10 Athletic Conference schedule on Wednesday by hosting the visiting Upper Sandusky Rams. In an error-plagued contest that would see the home team finishing with eight total miscues, the Rams would come away with the 8-5 victory. Upper committed four errors in the field on the afternoon as well. Upper took the early lead by scoring two in the first before the Eagles posted all five of their runs in the bottom of the second. However, the Rams would outscore their hosts 6-0 to finish up the game en route to the win. Gavin Feichtner started the game for the Eagles and worked the first four innings, allowing six hits, five runs (one earned), while walking one and striking out a pair. Drayton Burkhart came on for the remaining three innings, allowed six hits and three earned runs while walking one and fanning one en route to the decision. At the plate, Feichtner recorded a single while Burkhart belted a solo home run. Other offensive stats for Crawford were: Team- 7 hits total; Cade Hamilton- 1B, R; Trevin Fairchild- 1B; Caleb Lohr- 2B, SB; Daylen Balliet- 1B; Carson Feichtner- R; Brock Ritzhaupt- 2B, R, SB and Dylan Cooke- R.
After traveling to Upper for game two of the series on Friday, Colonel Crawford is set to hit the road for a non-conference clash with the Crestline Bulldogs on Saturday, March 30. On Monday, April 1, the Eagles will be back in N-10 action when they play hosts to the Carey Blue Devils. BUCYRUS — On Tuesday, the Bulldogs from Crestline were on the road against the hosting Bucyrus Redmen. For a second consecutive game, Crestline would find themselves one-run short, dropping the contest by a final score of 11-10. PLYMOUTH — The Crestline Bulldogs baseball team took their show on the road to Plymouth on Wednesday to clash with the hosting Big Red in non-conference action. Crestline would fall to 0-3 to begin the season, dropping the contest by a final score of 6-2. The ‘Dogs are poised to host the Colonel Crawford Eagles on Saturday and will begin Mid-Buckeye Conference action on Monday, April 1 against the visiting Lucas Cubs. On Tuesday, Crestline will head to Lucas for game two of the series.